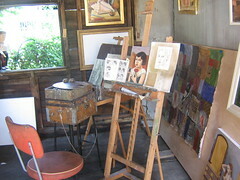 This is a shot of my new art studio in the carriage house behind our new house here in Grand Rapids. It is very rustic. There is no electricity, just a hurricane lamp for when I need to find something at night. The window in the back looks out into the fabulous garden of our neighbor Shirley. The window has no pane of glass, just a board that slip out and gets se to the side in the morning and put back at night. I like how rough it is because it feel like an adventure just being in there. I have a little more privacy then I have had for the last few years when I just worked in the middle of the house were traffic came and went.